A sidewalk is designed to meet a variety of characteristics that have a direct impact on usability, such as grade, cross slope, width, surface type, etc. Even mildly difficult features in combination can make a sidewalk hard to access for someone with a disability. Sidewalk design criteria are based on providing access to all pedestrian users to the maximum extent feasible. This policy is in accordance with federal standards set out by the US Department of Justice, based on recommendations of the US Access Board. Refer to Pedestrian Facilities and the Americans with Disablities Act for further discussion. 1. Design issues for pedestrians who use wheelchairs (10:00). 2. Design issues for pedestrians with ambulatory impairments (7:51). 3. Design issues for pedestrians with low vision (11:24). 4. Design issues for pedestrians who are blind (11:19). Sidewalks or pedestrian paths will be accessible to the maximum extent feasible to all people according to the Americans with Disabilities Act of 1990 (ADA). Barrier curb. Refer to Standard Plan 609.00. When sidewalks are constructed, a barrier curb is sufficient to separate pedestrians from vehicular traffic on low-speed roadways (posted speed of 45 mph or less). At higher speeds, a vehicle can mount a barrier curb at a relatively flat impact angle. In the event a sidewalk located adjacent to a high-speed roadway is necessary, another type of physical separation between the vehicle and the pedestrian will be considered. Guardrail and concrete traffic barriers are two of the options that may be considered. In rural areas where it is necessary to accommodate pedestrian movements, a paved shoulder at least 6 ft. wide may be used. The cross slope must be 1.0% (minimum) to 2.0%. A sidewalk located at least 2 ft. from a curb should be a minimum of 5 ft. wide. Exceptions may be made for local conditions, but ADA requirements must be met. A sidewalk proposed within 2 ft. of a curb will be placed adjacent to the curb and be a minimum of 6 ft. wide. Exceptions may be made, but ADA requirements must be met. For sidewalk widths less than 5 ft., a 5 ft. by 5 ft. passing space is to be provided at intervals no greater than 200 ft. The cross slope on all accessible routes must be 1.0% minimum to 2.0% maximum. The running slope should be as flat as possible, up to a maximum of 5%. However, sidewalks may follow the slope of the adjacent roadway if less than 5% is technically infeasible. Sidewalks across private and commercial approaches will be the same thickness as the paved approach and will maintain less than 2.0% cross slope. Accessible routes across side streets and alleys will be less than 2.0% on new construction and reconstruction projects. Less than 2.0% cross slope will be maintained across streets and alleys where feasible on all alteration projects. A clear airspace of 80 in. 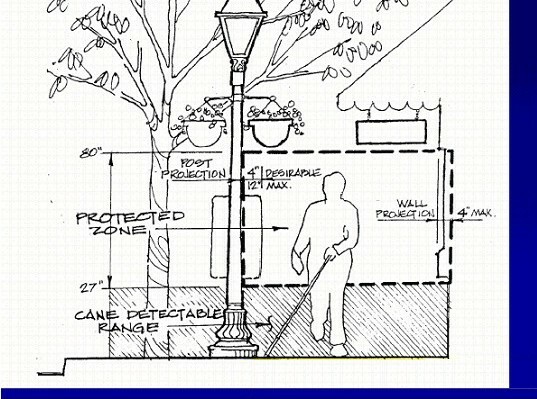 above the sidewalk will be maintained free of tree limbs, signs, fountains, poles or planters. Protrusions into the area of the sidewalk must not exceed 4 in. Where the curb is separated from the parallel sidewalk by a parkway (border), all house walks will be extended across the parkway (see Standard Plan 608.10). Housewalks will be 4 in. thick and at least 3 ft. wide. Steps to a house will be at least 3 ft. wide. Steps and housewalks will match the width of the existing housewalk. Steps other than house steps will be of sufficient width to fit a particular situation. Stairs located on MHTC right of way will be replaced with ADA-compliant curb ramps, where technically feasible, or an alternate route may be provided. Additional guidance regarding sidewalk design can be found in the AASHTO publication Guide for the Planning, Design, and Operation of Pedestrian Facilities, the FHWA publication Designing Sidewalks and Trails for Access, or Access Board's Accessible Public Rights-of-Way Planning and Designing for Alterations. In developed areas on low-speed roadways (posted speed of 45 mph or less), sidewalks are to be separated from the travelway by a barrier curb (see Standard Plan 609.00). At higher speeds, a vehicle can mount a barrier curb at a relatively flat impact angle. "...stable, firm and slip resistant..." "...minimize surface discontinuities..."
In the event a sidewalk is located adjacent to a high-speed roadway, another type of physical separation between the vehicle and the pedestrian such as a guardrail or concrete traffic barrier will be considered. 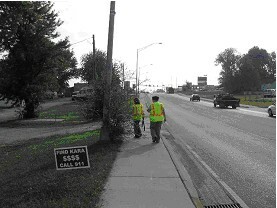 Sidewalks are not to be designated on paved shoulders located behind a mountable curb; nor shall paved shoulders be designated or striped as a pedestrian pathway, however if pedestrian use is anticipated, efforts should be made to meet ADA standards wherever possible, such as a 2% cross slope. Sidewalks are to be at least 5 ft. wide. However, if necessary due to geometric constraints, the width of the sidewalk may be reduced to 4 ft. minimum width, as required in PROWAG, by completing the Design Exception process. A 2 ft. grass strip or planting area should separate the sidewalk from the curb. 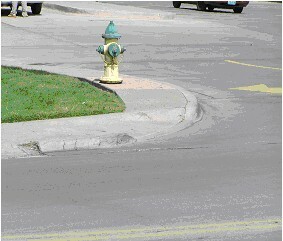 A sidewalk proposed within 2 ft. of a curb will be placed adjacent to the curb and be at least 6 ft. wide. 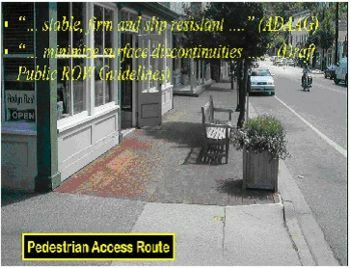 There are exceptions: sidewalk width may be reduced to meet site constraints; however, ADA requires a minimum width of 4 ft. to be provided in all cases (PROWAG R301.3.1). When a project alters the right of way space, the existing ADA elements within the limits of the project shall be made to comply with the applicable requirements for new construction to the maximum extent feasible (per PROWAG R202.3). This will include repairs and upgrades to existing sidewalks so the facilities provide a continuous minimum width of 4 ft. with a maximum cross slope of 2.00% (per PROWAG R301). For sidewalks narrower than 5 ft., 5 ft. x 5 ft. passing spaces need to be provided at intervals that are no greater than 200 feet. Such features as driveways, building entrances, parking lots and sidewalk intersections are considered acceptable passing spaces if they are 5 ft. x 5 ft. and meet the 2 per cent maximum cross slope requirements. The width of the accessible sidewalk route should meet the requirements above. Obstructions are objects within the pedestrian access route that reduce the clearance width, protrude into the circulation route, or limit the vertical passage space or of a sidewalk. These guidelines apply to permanent and temporary objects. The full width of the circulation path should be free of protruding objects, if possible. Permanent, stationary objects are not to project into the pedestrian access route more than 4 in. from 27 in. to 80 in. above the ground. Freestanding objects mounted on posts, pylons, etc., may overhang a maximum of 12 in. from 27 in. and 80 in. above the ground, although this situation should be avoided whenever possible. Figure 642.1.2 illustrates this protected zone. Surfaces of sidewalks and all parts of the pedestrain network must be stable, firm and slip-resistant. Care must be taken to provide an even and level surface. Highly textured surfaces such as cobblestones may cause discomfort for a disabled person with a spinal injury. Changes in levels up to ¼ in. may be vertical and without edge treatment. Changes in levels between ¼ in. and ½ in. will be beveled with a slope no greater than 1V:2H (2:1). Level differences greater than ½ in. need to be removed or ramped. 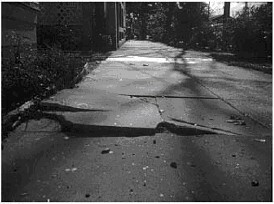 Over time, sidewalks may settle, become worn, or fall victim to people or nature. Maintaining a safe surface for everyone is very important. When the sidewalk is not owned or maintained by MoDOT, but may be adjacent to one that is, it is important to notify the proper authority that maintenance is needed. Step separation. 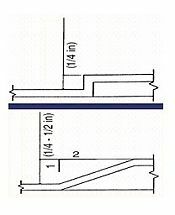 A vertical displacement of ½ in. or greater at any point on the walkway that could cause pedestrians to trip or prevent the wheels of a wheelchair or stroller from rolling smoothly. Badly cracked concrete. Holes and rough spots ranging from hairline cracks to indentations wider than ½ in. Spalled areas. Fragments of concrete or other building material detached from larger structures. Settled areas that trap water. 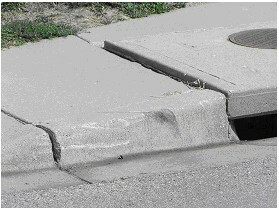 Sidewalk segments with depressions, reverse cross slopes, or other indentations that make the sidewalk path lower than the curb. These depressions trap silt and water on the sidewalk and reduce the slip resistant nature of the surface. Tree root damage. Roots from trees growing in adjacent landscaping that cause the walkway surface to buckle and crack. Vegetation overgrowth. Groundcover, trees, or shrubs on properties or setbacks adjacent to the path that have not been pruned can encroach onto the path and create obstacles. 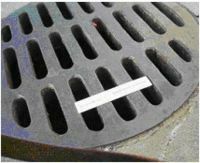 Utility covers, such as for manholes, drainage or water meters, need to have a slip resistant top, as much as possible, and meet changes in level criteria. Lifting holes on covers need to be less than ½ inch in diameter or be satisfactorily plugged so a cane cannot get lodged in the hole. If grates are located in the sidewalk or other walkways paths, the grates will have spacing no greater than ½ in. wide in one direction. If grates have elongated openings, then the grates will be placed so that the long dimension is perpendicular to the dominant direction of travel. Refer to Figure 642.1.3. The running slope, or grade is defined as the slope parallel to the direction of travel, with the running grade defined as the average grade along a continuous grade. The grade of a sidewalk should be as level as possible allowing easy use by travelers. For pedestrian facilities on public access routes, the running grade of sidewalks will be a maximum of 5%. If this is technically infeasible, the sidewalk may be consistent with the running grade of the adjacent roadway. If the sidewalk cannot be kept at the same grade as the adjacent roadway and the grade is greater than 5%, the sidewalk may be considered a ramp and designed in accordance with EPG 642.2 Sidewalk Ramp and Curb Ramp Design Criteria. The rate of change in grade, the algebraic difference, measured over 2 ft. intervals, is not to exceed 13%. An example of a 13% change in grade is shown in Figure 642.1.4.1. 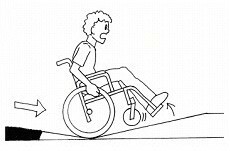 Figure 642.1.4.2 illustrate how excessive slopes impact wheelchairs. Figure 642.1.4.1. The gutter slopes counter to the slope of the curb ramp to promote drainage. Cross slope is defined as the slope measured perpendicular to the direction of travel. A minimum slope of 1% should be provided to allow proper drainage. 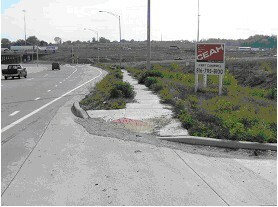 When necessary the maximum 2% cross slope allowed by ADA standards may be used. Cross slopes of less than 2% are desirable to provide easier passage and to allow for some construction tolerance and settlement. Sidewalks with a cross slope greater than 2% are noncompliant and must be made compliant by whatever means necessary and including replacement. 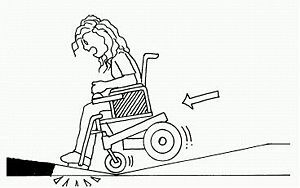 Cross slopes are very difficult for some people with mobility impairments to negotiate because it is harder to travel across sloped surfaces than horizontal surfaces. People with mobility impairments who are ambulatory or use manual wheelchairs must exert significantly more energy than other pedestrians to traverse sloped surfaces. 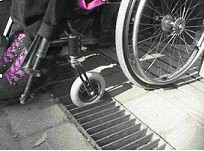 Both powered and manual wheelchairs can become unstable and/or difficult to control on sloped surfaces. Whenever possible, slopes are minimized to improve access for people with mobility impairments. Landings are level areas built to provide pedestrians with a place to rest or make turning maneuvers, or where it is necessary to have a level, stable area to allow access to another feature such as a pedestrian pushbutton. The slope of a landing should allow for drainage and be designed and built with a minimum 1% slope and may not exceed a slope of 2.0% in any direction. For more information on the use of landings in ramp design refer to EPG 642.2.1 Slope and Rise of Sidewalk Ramps. For more information on the use of landings with regard to curb ramps, refer to EPG 642.2.2 Curb Ramps. This page was last modified on 5 October 2018, at 08:24.